Security is a very important aspect for MQTT brokers. In a previous article you’ve already learned how to implement authentication and authorization. The weakness in that configuration was that credentials were transmitted in cleartext; it was therefore possible, for an attacker who can sniff the network traffic, to read and use them to impersonate a legitimate client. To be able to encrypt the communication, mosquitto requires a server certificate. The first line changes the TCP port mosquitto is normally listening to (1883) to the default port for SSL connection, 8883. The following 3 lines set the path for server and CA certificates and for the private key that corresponds to the server certificate. The last one, which is not compulsory, forces the use of the TLS v1.2 protocol, the most secure one at the moment of writing. 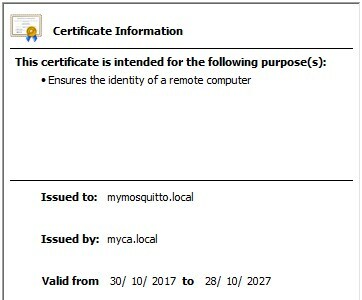 With -p you specify the TCP port of the server, with –cafile the path of the CA certificate which signed the server certificate mosquitto uses and finally with –insecure you configure the two clients not to verify that the certificate’s common name (in my example mymosquitto.local) corresponds to the server name. 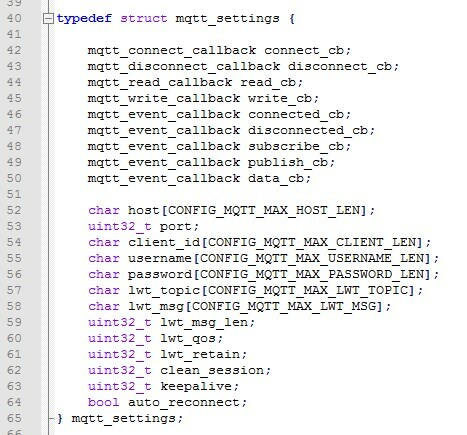 Tuan PM developed a library (espmqtt) for the esp-idf framework that implements a complete MQTT client. Moreover, the library does support secure connections, you can therefore use it to connect to an MQTT broker with TLS enabled. the espmqtt library does not copy the parameters in an internal struct. It’s therefore very important that the mqtt_settings variable has a global scope and it’s defined outside a specific function. Your program can interact with the MQTT client implementing its callback functions. The connect_cb and disconnect_cb functions perform the “real” connection and disconnection, while connected_cb and disconnected_cb functions are executed after the corresponding activity is completed (= the client successfully connected to the server). Your program usually doesn’t need to re-implement the main functions, but will implement the ones related to events, to execute actions (for example subscribe a topic) when a specific event occurs. I prepared an example to show my esp32 devboard sending data to a mosquitto server, with SSL enabled. I connected to the devboard an HTU21D sensor as explained in a previous article and my program reads, every 5 seconds, the temperature and humidity values and sends them to the broker. I used a very handy opensource program, HelloIoT, to create a dashboard and display the received data.